Harman Kardon has introduced two new products, the Harman Kardon Go + Play portable iPod sound station (above) and the HK 700 Series in-ear noise-isolating earphones. 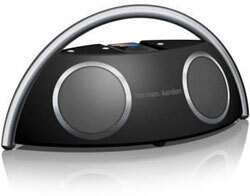 The Harman Kardon Go + Play features a stylish stainless-steel handle, touch volume and mute controls, and an RF remote. The remote effortlessly controls volume, track selection and iPod menu controls at a range of up to 30 feet, even through walls, making it the ultimate portable sound system. The unit’s design allows the iPod to lie flat, keeping it secure. Combining bi-amped digital amplification, DSP (digital sound processing) and Ridge and Atlas transducers, Harman Kardon Go + Play produces powerful bass and clean treble. Eight D batteries allow the user to bring the Harman Kardon Go + Play virtually anywhere, and to enjoy favorite tunes for up to 18 hours of continuous playback. The Harman Kardon Go + Play provides an S-video connection, letting users connect it to a TV or monitor to watch podcasts from an iPod. Noise canceling occurs naturally with HK EP 710, EP 720 and EP 730 earphones, which were designed to seal comfortably in the ear canal. Users may select from either the included 3-flange eartips or foam inserts for an ideal fit. Because the earphones isolate noise from 30dB (EP 710) to 40dB (EP 730), consumers won’t have to worry about distractions from outside noise. The HK 700 Series isolating earphones transport the user to his or her own personal concert, delivering clean, precise sound with enhanced bass. All three models are offered in black or white and will connect to an iPod, MP3 player or other portable music source. Offered in black, the Harman Kardon Go + Play has a suggested retail price of $299.95 and will be available at major retailers starting in November. The HK EP 710 ($99.95), available December 2006, HK EP 720 ($149.95), available October 2006, and HK EP 730 ($199.95), available October 2006, are offered in black or white. Both units will be available at www.harmankardon.com.